One of the easiest and most satisfying meals to whip up at home is a burrito. All you need is a tortilla and a few basic foods and you can create almost any type of burrito you like. From the standard beef and bean burrito to breakfast burritos and classics like the carne asada, the filling options are numerous. Popular combinations offer a good starting point. After you master these basic recipes, you can move on and experiment with your own fillings. The rule of thumb with burritos is, if you can dice it or shred it, you can add it to a tortilla. Just remember the sauces: Salsa and hot sauce are classics but you can adjust according to your preferences. After you've decided what to put in it, the proper burrito folding technique will ensure all of your delicious fillings stay inside. Despite the great variety of burritos in the world, there is a "standard" that includes a number of basic Mexican ingredients. This is what you might expect if you order a beef and bean burrito at a restaurant that doesn't define any special ingredients. The standard burrito includes seasoned ground beef, refried beans, shredded lettuce, diced tomatoes, sour cream, and your favorite chili sauce. Wrap that up in a tortilla and enjoy the classic taste. Breakfast burritos are a tasty way to start the day—and once you realize how easy they are to make, you'll be filling and folding these at home all the time. For a zesty breakfast burrito, combine scrambled eggs, cooked and crumbled chorizo, mozzarella or Jack cheese, diced tomatoes, and chili sauce or Tabasco. If you're not a fan of chorizo or don't in the house, you can replace it with the meat of your choice: Cut-up sausage links or patties, crumbled bacon, or sliced kielbasa or ham make great alternatives. Huevos rancheros make a great filling for an open-faced breakfast burrito that's also quite easy to assemble: Add one fried egg, warmed chunky salsa, and refried beans to the tortilla. Seafood and chicken are excellent protein options for a burrito, and there are many different directions you can go. The Cabo San Lucas is a classic seafood burrito. This one combines cooked shrimp or lobster, Jack cheese, coarsely chopped cilantro, and refried beans. To make a creamy sauce simply mix vinegar and mayonnaise to taste. The Puebla burrito is a favorite for anyone who prefers chicken. For this burrito, simply combine shredded chicken, mole, and diced onion. Beef and pork are the most popular meats for burritos and you can create some fantastic combinations using these ingredients. For instance, the burrito Guadalajara uses seasoned ground beef, Spanish rice, Jack or mozzarella cheese, and diced tomatoes. If you're in the mood for a steak burrito, turn to the iconic carne asada. This one features marinated grilled steak with black beans, cilantro, and diced onion. For a pork burrito, you'll definitely want to try the Acapulco. This one gives you the choice of carnitas or shredded pork, both of which are easy to make and can be stored for future burritos. To complement the meat, simply add diced green chiles, shredded Jack or mozzarella cheese, and Spanish rice. When creating vegetarian burritos, you have many choices for adding protein. 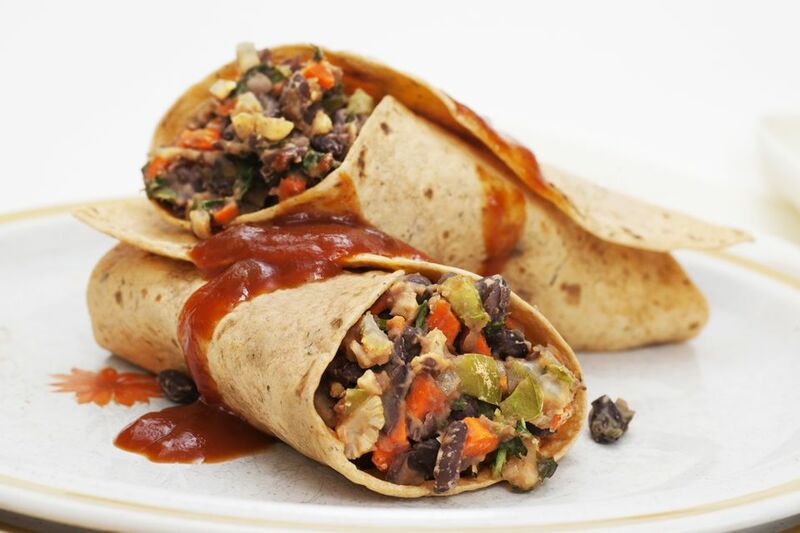 A classic veggie burrito would include refried pinto beans, red chile sauce, and shredded cheese. Many people like to combine beans with rice and you can add tomatoes, cilantro, or any of your other favorite vegetables and herbs.